The Parish Council is comprised of 15 Councillors, click here to meet your council. The previous election took place in 2015 of which 12 of the current councillors were elected, three members have since been co-opted. The next election for Wroughton Parish Council will be in 2019. Four office staff are employed for administrating the Parish Council and four members of the grounds team are responsible for maintaining our local Parish. The following Public Notices are provided for information. Copies are also displayed on Parish Noticeboards. For further information please contact Streetworks on 466380 or online at www.swindon.gov.uk/highwayregulation. Gwillam Lloyd, Head of Highways and Transport Services, Swindon Borough Council. Wroughton Parish is one of the largest in Wiltshire and has a wide diversity of both village facilities, farming and protected countryside. It contains a conservation area which includes many old buildings which require protection from inappropriate development. The parish will be undergoing major change in the coming years with the development at Wichelstowe north of the M4, with another 4,500 homes being built. The Council aims to protect and enhance the current village of Wroughton and the surrounding parish and to make policies that will retain the parish and its special character for future generations. In addition to the Full Council, the Parish Council operates through its four committees: Planning, Leisure & Amenities, Environment & Road Safety, and Finance & General Purposes. Each Committee has its own terms own Terms of Reference and Delegated Powers. Click here for further information and documents relating to specific committees. Wroughton’s Neighbourhood Plan was produced after consultation with residents, local businesses and organisations, Swindon Borough Council, potential developers and a number of statutory agencies. The draft Plan was published in September 2014 and following consultations and independent inspection was updated and formally adopted by Swndon Borough Council on 14 July 2016 (click here to download the Decision Statement). Wroughton’s Neighbourhood Plan is now a recognised planning document to be used when allocating development sites in the parish. Residents voted overwhelmingly in favour of the Wroughton Neighbourhood Plan at the referendum on 9 June 2016. The turn-out of just over 40% is one of the highest turnouts in the country for a Neighbourhood Plan with 87.5% of the electorate voting in favour of its adoption. It has been a long process which started 3 years ago and the Parish Council would like to thank all the local organisations and parishioners for their help in the production of this plan for the future of Wroughton. Steve Harcourt, Chair of Wroughton Parish Council said ‘The residents of Wroughton have given a strong message that they support the plan and I would like to personally thank everyone that voted’. 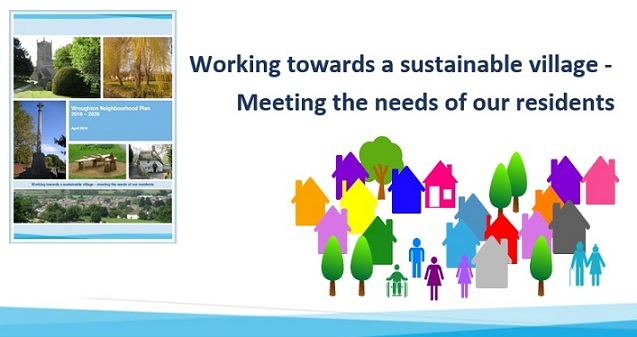 Click on the links below to download a copy of the Neighbourhood Plan. Copies of these documents and further information can be obtained from the Parish Council office. This document lists the current projects being undertaken by Wroughton Parish Council and their progress. It is updated and reviewed every six months by the Parish Council. Please use the links below to view financial information relating to the Council’s operations. All queries relating to this information should be addressed to the Clerk. 2016/17 Transparency Code Report – Details of expenditure exceeding £500 for the Municipal Year 2016/17. Click on the links below for details of entries taken from the book of Declaration of Acceptance of Office by Parish Councillors. The Finance and General Purposes Committee will meet monthly and deal with all financial aspects of the council. They are responsible for reviewing the financial accounts and the quarterly review of the councils budget. In addition they are responsible for staff appointments including salary reviews, new leases and the renewal of existing leases, the organisation of the Annual Remembrance Day Service and any other matters of a financial nature. The Planning, Safety and Highways Committee will generally meet fortnightly. Committee membership is open to all Members of the Council. They respond to Planning Authorities on behalf of the Council in respect of planning applications, planning documents and planning policy documents. They are responsible for tree preservation orders, reviewing and responding to enforcement notices and any other matters of a planning nature. The committee monitors traffic, parking and pedestrian issues in relation to the safety and highways of the parish. The committee also monitors policing within the parish and receives police reports. The Community Buildings Committee generally meets quarterly. Committee membership is open to all Members of the Council. They manage the community buildings at the Weir Field, Maunsell Way, Wharf Road and other buildings owned or leased by the Parish Council including the Workshop at Berkeley Farm. They consider any new or refurbishment of existing community buildings. The committee also administers and maintains the Weir field pavilion and the Maunsell Way pavilion as well as monitoring the provision for young people within the parish including Wroughton Youth Club. The Open Spaces Committee generally meets quarterly. Committee membership is open to all Members of the Council. The committee deals with matters relating to the open spaces within the parish. They are responsible for all the vehicles and machinery owned by the council, the maintenance of the play areas which also includes inspections, the maintenance of grass verges and administering the litter bins and dog waste bins. They determine charges for use of the sports facilities and the allotments. In addition the committee is responsible for the Footpaths & Cycling Working Party, the Allotment Working Party, the Christmas Working Party and the Play Area Working Party.